High temperature steam cleaning in Edmonds,Wa. If you have own your own home or business, or if you have rental properties such as apartments or condominiums, it’s important to have the carpets inside professionally steam cleaned periodically to keep it looking good. We provide a professional truck mounted carpet cleaning service that’s second to none, and we have earned hundreds of satisfied customers over the years. 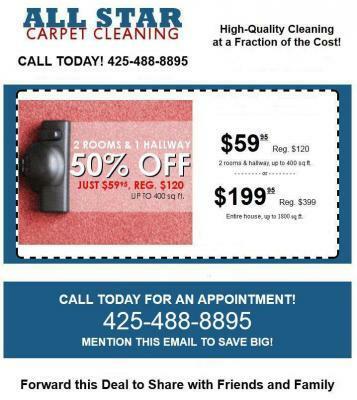 After you invest a good deal of money in quality carpeting throughout your home or business in Edmonds,Wa. you need to protect your investment and add to your carpet’s long life by having it professionally steam cleaned as required. There are several different carpet materials available; however, all types of carpets attract hair, dirt, stains, dust particles, mites, odors, and more. Dirt that settles deep down and into the base of the carpet fibers can cause early wear and tear on the carpet and shorten its lifespan. Regular high temperature steam cleanings will have your carpet smelling fresh, looking clean, and lasting many years longer. If you have a special warranty on any of the carpeting in your home or business, be sure that you are up to date with the information in the paperwork. Many carpeting manufacturers’ warranties require that you have your carpets professionally high pressure steam cleaned at least once each year. If you happen to have smokers in the home or office, then you must have your carpets cleaned more frequently. Particles and odors become trapped in carpet fibers and quickly start causing irritations and an unpleasant odor. If this is the case, then you should have your carpets high pressure steam cleaned every three months. Everyone loves their pets like family members; however, they can cause severe damage to your carpets when you’re not paying attention! If you own a dog, cat, or bird, then have your carpets cleaned every six to 12 months. It’s also important to run the vacuum frequently as well. If you have very little traffic in your living area, then your carpets should be high pressure steam cleaned every 12 months or so. Feel free to give us a call for a free estimate today. High temperture steam cleaning in Edmonds,Wa.